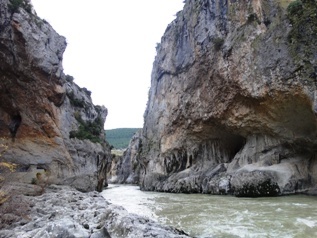 About 1h30min drive from San Sebastián and just 30min from Pamplona, in the central part of Navarra, the Foz de Lumbier makes a very pleasant day trip involving a walk along a limestone-walled gorge through which the River Irati passes. 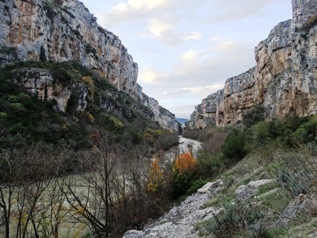 This river flows down from the Selva de Irati forest in the Navarra Pyrenees into the Aragon River, and the actual track through the gorge is the former Irati railway line linking Pamplona with Sangüesa, which was shut down in 1942. 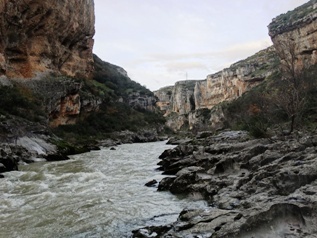 The two ends of the gorge are just a few metres wide and the spectacular geology of the area together with its fauna led it to be declared a special Nature Reserve in 1987. The Foz de Lumbier is close to the village of Lumbier, itself just off the main Pamplona-Huesca. 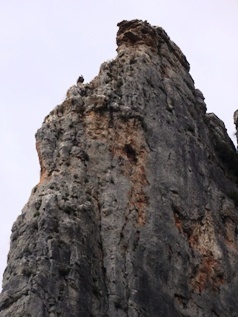 Ornithologists come from afar to spot the many griffon vultures that can practically always be seen soaring high above the gorge and perched on its reddish/orange-coloured vertical cliff faces. Many other birds can also be spotted in and around the Foz de Lumbier, among them crows, jackdaws and swifts. Beyond the last tunnel is an information panel about the Foz de Lumbier, just beyond which a narrow path leads off to the light towards the remains of an old bridge at the southern entrance to the gorge called El Puente del Diablo (Devil’s Bridge). However, extreme caution is needed as the path is really narrow and is partially exposed high above the river, and is most definitely only for those who are very sure-footed and have no vertigo problems.For walkers, there are two options. The first involves simply following the old railway line through the entire 1.3km length of the gorge to the tunnel at the far end. Note that a torch/flashlight is handy for this and the other tunnels along the gorge, as they really are dark in the middle! It is also possible to walk a very well-marked loop (in green and white) that starts from the picnic site a short distance before the entrance to the Foz de Lumbier and takes the walker up to the plateau above the gorge – most of this route is on a wide gravel track – to eventually descend to the old railway line further along the Irati River which takes you to the information panel and end tunnel mentioned above. Out and back from the car park to the end of the gorge of Foz de Lumbier is about 4km, the full loop about 7km. 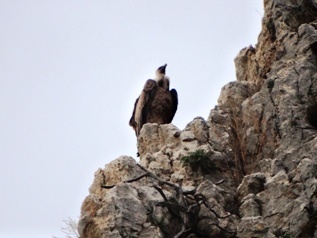 On the day I went (a crisp yet clear late November afternoon), there were quite a few griffon vultures and many jackdaws around, and the sunset in the middle of the gorge made the rock take on an even more brighter glow than usual!